For once this isn’t an article from CHL about document and email management. This article is about why, as a Mac using lawyer, attending the forthcoming MILOfest event in Florida can reap benefits to you and your business that go beyond the material covered in the presentations. Just in case you don’t know, MILO stands for Macs In Law Offices, and it’s a group of individuals and organizations who delight in getting the very best return from their decision to adopt Mac in the work place. Macs and other Apple products are on the ascendancy in law firms. This trend looks set to continue with Apple’s continued focus on ease of use and the subsequent gains in productivity this delivers. Even today no other manufacturer produces tablets and laptops that can be so easily used wherever you are. Apple products are packed full of tricks and features that can make a big impact on productivity. But finding the time to discover these for yourself can be difficult. At MILOfest you meet people who simply love pushing their Apple devices to the limit, they know all the tips and tricks to improve your productivity. Of course there are always a small number of hand picked vendors at the event too. All of them are like us, focused and committed to developing and delivering the very best productivity tools and services for the Mac user. MILOfest is just the perfect event to meet these vendors, and put forward your suggestions and requirements. I know in our case that a great many of DocMoto’s most productive innovations have come from the people we have met at MILOfest. Mac usage within the legal world continues to rise and MILOfest more than any other event drives the force of change. As more and more lawyers see the benefits of using Mac for business so vendors respond with more and better developed products. Overall that has to be good for everyone. Begin your journey and register now. 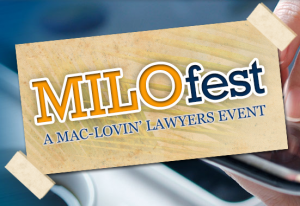 To book your place at MILOfest 2014 just click here to register. Source: “MILOfest 2014 – Four good reasons to attend” published CHL’s DocMoto Blog.